The anticipation of going to the new airport in Bangkok was so exciting that everyone in the village of Bang Ta Ngai was curious about what it looked like. 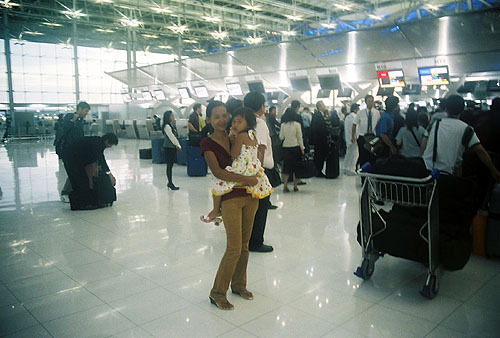 Thailand finally opened it's new airport on September 28, 2006 after 40 years of planning and construction. 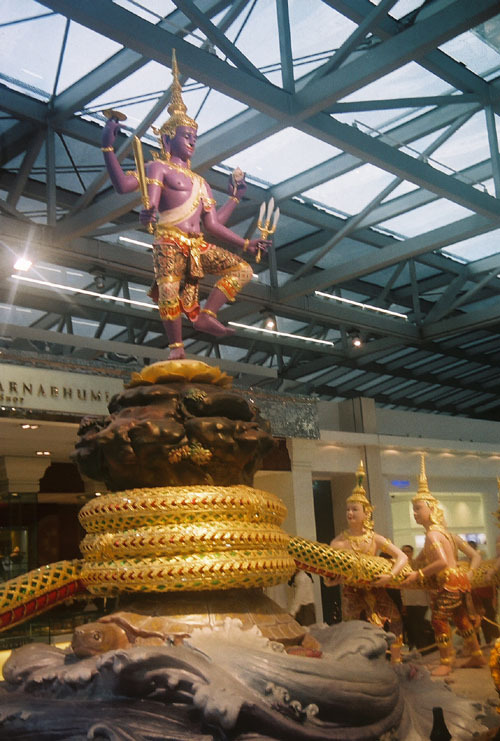 Suvarnabhumi was going to become the jewel of airports in Asia. 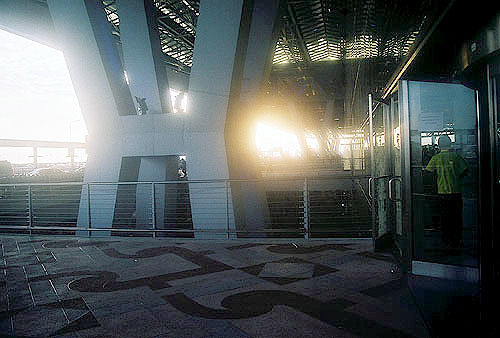 On October 4, 2006, one week after the opening, I would pass through customs and depart on a flight for San Francisco. After spending three years teaching English in Thailand it felt a bit odd to leave only because I become very accustomed to the way of life in Thailand and also because I watched my daughter grow up and become a very wonderful little girl, as well as watching Dow become a beautiful young lady and Dune to becoming a playful boy. So, returning to America brought about a mixture of feelings. On the one hand I wondered what the mood in America would be like as a result of the on-going war in Iraq, and on the other hand I wondered how my life in Thailand would effect how I saw things in America. It was not an easy transition for me. The village life with Na and the kids was completely rural where a very sustainable existence was what I became used to. I knew the modern world in America would be very different, but I really didn't realize how different. Na and Gada along with myself left the hotel very early in the morning, and we were both very very quiet knowing we were about to separate for many months. 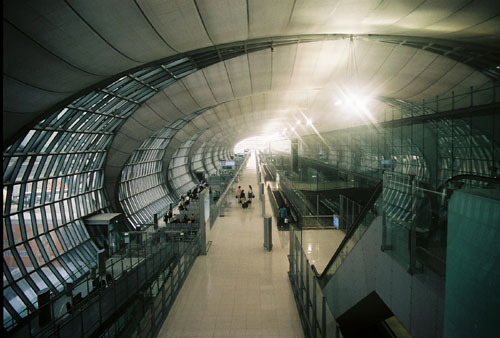 When we arrived at the airport the one outstanding feature was Suvarnabhumi's size. As far as the eye could see there were lights defining the long runways and in the distance there could be seen the unique architectural signature which defined the Suvarnabhumi airport. The closer we got the larger everything became until we finally found ourselves fully enveloped under the dramatic arched ceiling of the airport. No matter where you looked there were glass panels reflecting the early morning sunrise with the control tower standing out as some lone skyscrapper in an unfinished city. When compared to the village, with its rice paddys and coconut trees, the airport was a statement on how far humankind had advanced in its abilty to create architectural structures which seemed to come from some race of people in the distant future. It was difficult for me to comprehend that the majority of people in the Thai nation would never have an opportunity to see such a modern building the likes of which Suvarnabhmi presented to the world. From a tradional farm based economy Thailand was profiling itself to become a very sophisticated nation with the majority of its citizens farming their rice fields. In many ways it was frightening to stand beneath the glass arched roof and walk on the polished tile floor dotted with rows of stainless steel ticket booths. Here was the newest additon to SE Asia's transit depot that was going to shuffle travllers around the globe. 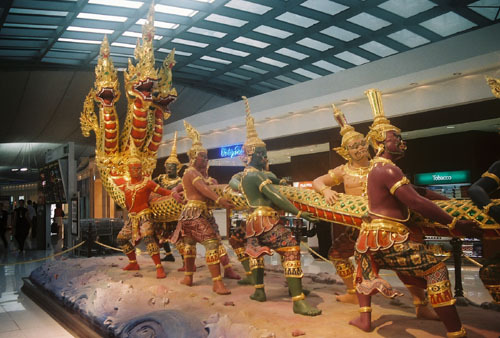 Here was the airport designed to receive over 45 million travellers a year making Thailand one of the most significant destination points in this part of the world. But for Na and myself carrying Gada, it was a space devoid of trees and rivers and rice fields. 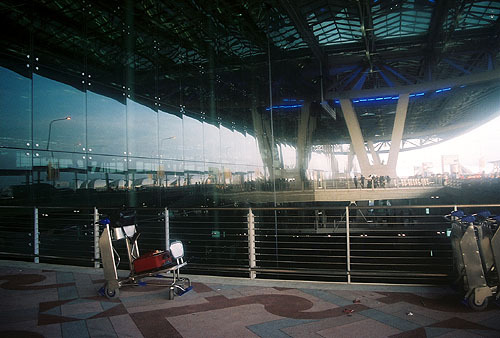 It was as if I was going to be surgically removed from Thailand, and by the looks of all the apparatus that was placed under this vaulted glass palace dedicated to traveling, I was also going to be removed by equally enormous winged machines sitting outside the glass panels like hungry lions waiting to devour their prey. 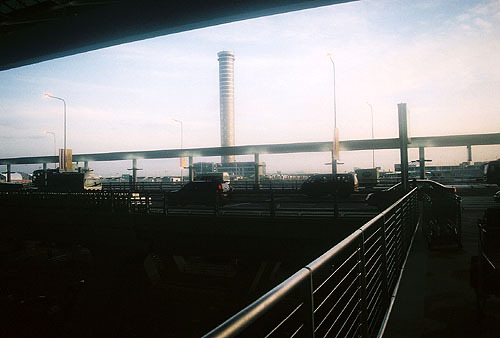 Na and Gada felt very uncomfortable and watched me push my luggage cart toward the shining stainless steel counter where upon the luggage was swiftly transported into the bowels of the new airport. Na squated down on her hind legs holding Gada, as she would always do in the village, looking very remorseful, totally sad and confused as to all she could see around her as she tried to understand what it must be like to fly having never been on an airplane. I too was awe struck looking at the seemingly impossible way all of the glass panels were held in place by five stange fingered metal creatures who might live in some cave on a distant world. 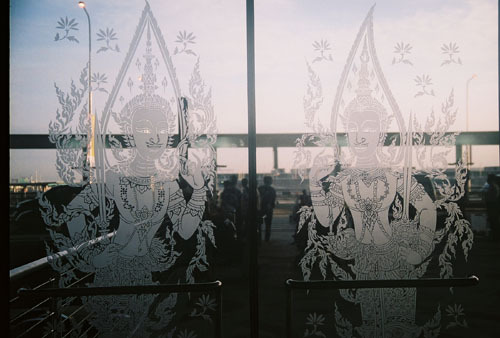 The last image I saw of Na was through etched glass doors with beautiful Thai dancers projecting a veil of myth separating one world from another. Watching the taxi disappear on the other side of these transparent dancers conjured up in my mind angels flying off to heaven, and I knew then that Na and my daughter were being returned to a land far removed from the glass and stainless steel world of the 21st century. Lost in my thoughts beneath the golden glow of the rising sun illuminating the high arched roof of the airport I came upon the most wonderous sight of the myth which portrayed the churning of the milky ocean. It was almost inconceivable that such an ancient myth could be placed in such a modern setting. 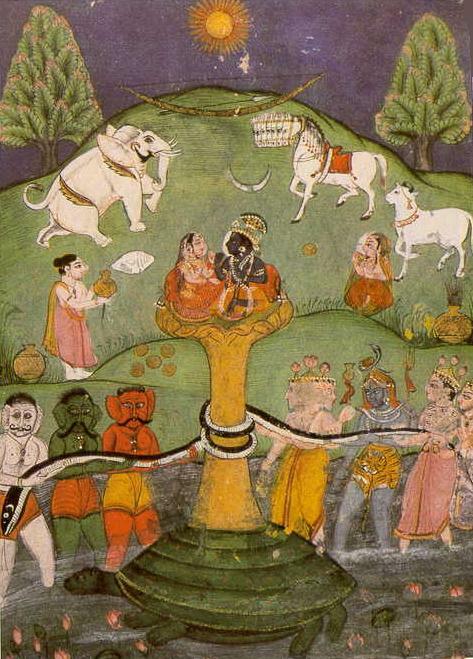 But there it was in dramatic color showing the Asuras and Devas pulling on Vasuki's tail, the serpent king, wrapped around the base of Mt. Mandara with Vishnu on top painted in electric blue holding the world axis which stabilized the universe. 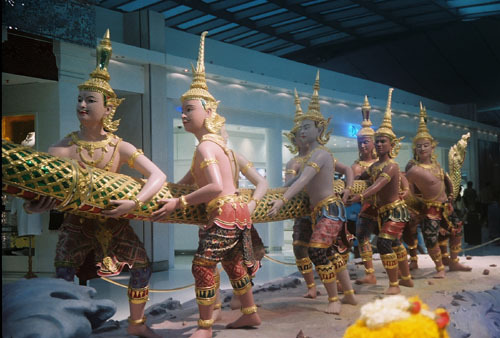 Here in the middle of Suvanabhumi Airport was the modern reminder of the transition from age to another. And perhaps the scuptor had intended the blue figure standing high a top the mountain to be Shiva. It was Shiva who swallowed the poison that spewed forth from Vasuki's mouth after the churning took place for a thousand years. It was then that Shiva's throat became blue which in turn gave him the name of the god with the blue throat. But instead the sculptor painted the entire figure blue. Seeing this ancient mythological scene made me realize the world I was leaving and the world I was about to enter. I left behind a world born of ancient myths which still honored the language of the vedic gods. Na and Gada were to return to their home where the days were defined by honoring Lord Buddha, and my days were going to be defined by a very advanced technological world that was slowly diminishing the opportunity to live a life born from these anciewnt myths and more by adapting to machines. I feel fortunate that I know where the portal into this mythological world lies. It is this world that offers a stairway to the heavens. Hopefully I can share my awareness of this world that leads to the realm of the gods before I return to Thailand. If I can share something of what I know I will feel satisfied. I was born out of a machine world, but have been re-born into the kingdom of Lord Shiva. 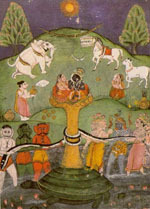 Om Namaya Shivaya. The heart of the mighty bird was pounding rapidly outside of the small windows deep within its belly. My mythological world of Shiva, Vishnu and Brahma, the world I just spent three years living in, was being churned by the sound of the engines slung under the wings of Garuda. I became Vishnu flying his mount to enter another world, a future world where all the conflagrations of humanity could be viewed on a tiny screen attached to the seat in front of me. Strapped inside Garuda's belly a cochophony of sounds, mixed with languages from other parts of the world, created a world of unknown impressions that were apart of my preparation to soar into the heavens. Myth and reality were swirling together and the giant bird reached out to the clouds, and the world of caves and mountain tops receeded away from view. Torn away from my sacred roots I was left alone with my thoughts as the pounding heart of Garuda slowly turned into a pulsating monotonous drone of mechanical gyrations. I was flying in the clouds and I felt I was still in my mythological world when all of a sudden the snow capped mountains of the Hymalyas appeared on the tiny screen in front of me. I could not believe my eyes for there in front of me was Mt. Kalisa, home of Shiva and Parvati. I was so overtaken by what I was looking at that I felt I was returning to my home in the mountains to be re-united with my wife. Still confused and adjusting to my new surroundings I could feel that somehow I was being reminded of what I was told on that early morning on top of Lingaparvata. Shiva was showing me the way to his kingdom and I felt reassured he was still with me as my mind slowly left the world of myth and entered into the world born out of those ancient beginnings. The Hymalyas were at first covered with snow and then they turned brown and voices could be heard decribing Shiva's home and then I realized it was not the voices of the gods but of a man called Al Gore. Al Gore was telling the truth about the world. He was tellng an inconvenient truth, a truth that made me face the world ignored by humanity, a world slowly being destroyed by the people of the earth. The home of the gods was being polluted and ravaged and humans were dying, oceans were becoming over heated, snows on mountain tops were melting, and an inferno of hell was being created to devour all life as we know it. Shiva was howling with winds blowing water and ice and earth over all the land and the Tandava, the dance of death, was taking place before my eyes. After I watched the ritual of destruction I fell back into my seat exhausted. 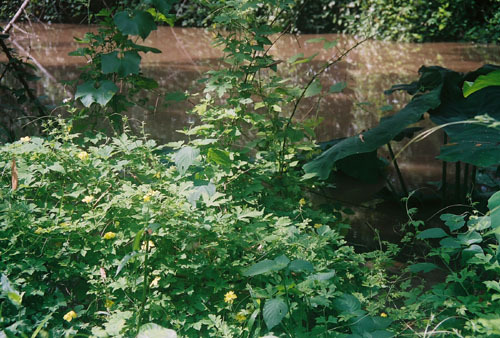 From the temple of Wat Mongkonsathit, where I would quietly sit next to the Ping River in Bang ta Ngai, to flying high in the sky over the Pacific ocean I realized I was no longer in my home of trees and rivers and especially my family. Now I was about to enter the high art of the 21st century thousands of years removed from the birth of existence granted by Lord Shiva. Now I was going to see how Lord Shiva was taking it all away only to replace it with another world full of the hopes to once again bring a golden age to this planet. The dance of Siva was in full swing and I was going to watch this dance and learn how I could be part of this ritual of renewal before I returned to my home next to the Ping River in Bang ta Ngai. The cauldron of the 21st century was boiling with inventions and discourse. Wars were being waged and the killing fields were everywhere. Desperation mixed with hope was broadcast daily over the airwaves. KPFA radio in Berkeley, California was revealing all the atrocities making it hard to concentrate on communicating with people. There were others who were trying to provide the last vestiges of humanities hope and assistance as the waters of the oceans began to rise and the fires created by Shiva's dancing feet prepared for a new beginning. Ed Artis from Knightsbridge.org was entering the very bowels of the earth to help people who were left abandon by governments and other relief agencies. The life of this one man became known through a film directed by Adrian Belic titled, " Beyond the Call". I met Ed Artis in San Francisco on December 2, 2006 and he has battled forces more formidble than himself and succeeded in delivering help to displaced children all over the world. Wendy Doniger O'Flaherty, Dean of the Divinity Scool of Chicago, continues to reveal the tuth of Shiva as she travels the world bridging myth and reality with her scholarly reporting on how the vedic scriptures offer humanity a direction by which to guide their lives. And finally we must set our sites to the heavens where ultimately the grandest event of all is taking place within our local galaxy. A profound change with the destiny of humanity is currently unfolding inside the planetary psyche. 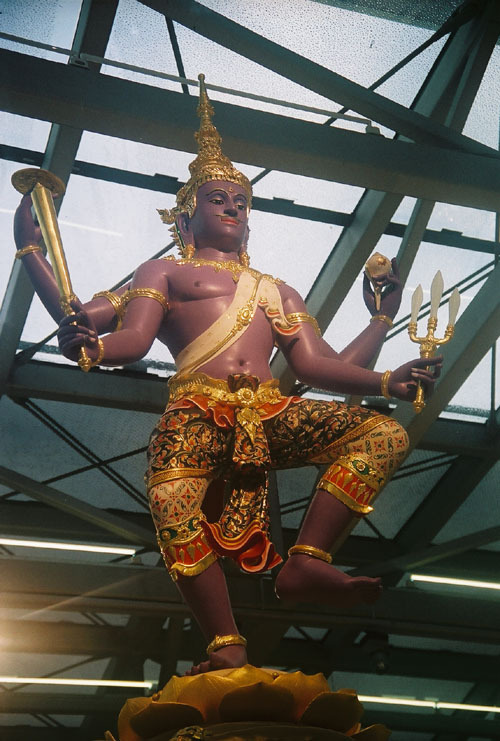 How very appropriate it was, therefore, that the Suvarnabhumi Airport would contain the very same sculpture that is depicted on the eastern gallery wall at Angkor Wat in Cambodia. For what exactly is the churning of the milky ocean telling us? And what profound change is humanity experiencing? The mixture of myth and reality were once again woven together in my mind and I knew that there was a connectedness and deep relationship between the heavens and our planet located on the outskirts of our local galaxy. The eye of Brahma was looking upon us as we struggled to redefine ourselves as everything we cherished on our home planet would be scrutinized by Brahma. Through an agreement made betwen Brahma and his son Shiva the birth and death cycle was finally at our door step. Humanity was about to undergo a change so complete and so everlasting that only by realizing how these changes were coming about would any sense of salvation be possible. It was a change where all of our bodily manifestations would be burned, but the soul force, crafted by the designers of our universe would redeposit us in a new world age so different and so unfamiliar to anything we could imagine. But it was in this new world that our soul bodies must find harmony and balance otherwise the soul too would be sacrificed. The heart of humanity was being weighed, and the harmonious relationships of soul building was about to take place. This was the time of the creation of a new world age, a new divine world order and the fire and lightning were only catalysts created by Shiva to give us all a new beginning. Now it was time to integrate my world views into the land I was created in. Transposed from the temples and caves of SE Asia, to the high rise corridors of the modern age I would seek a way to bring back to my home, next to the Ping River, the resources to protect my family and foster a way to prepare for all our fates as Shiva dances ever more quickly bringing down the edifice of corruption and lies which have made a hell for humanity rather than a heaven. Siva's hell was only a precusor to a new dawn, a new world where once again the purity and vision for a better future would be available to all who left their dualities behind. This was truly a new beginning being born out of the cauldron of humankind's own self deceit. Fortunately a higher order of creativity was being fostered in the heavens, and fortunately there were those who would mirror that higher order to give hope and guidance to all of us as we burn and ascend out of our ashes. Garuda in that sense was the phoenix as I landed upon those earthly fires to learn how to be reborn.